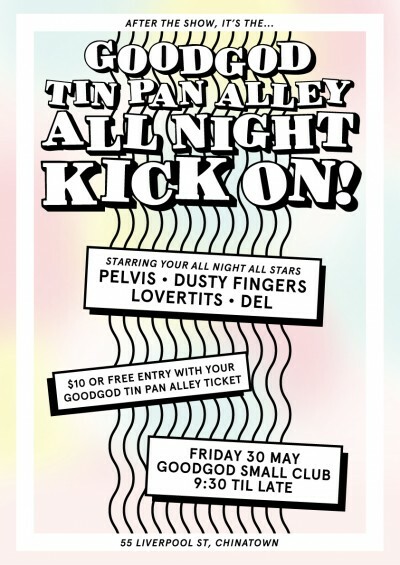 GOODGOD Small Club ~ GOODGOD TIN PAN ALLEY: ALL NIGHT KICK-ON! GOODGOD TIN PAN ALLEY: ALL NIGHT KICK-ON! After the show, it’s the ALL NIGHT KICK-ON! We’re throwing a huge stage spectacular at the Opera House for Goodgod Tin Pan Alley, and afterwards everyone’s invited back to celebrate in the biggest way possible with a bunch of our fave DJs, friends and guests. Our Danceteria will be full of danceable vibes from around the world ’til late, while Yo Grito! will be holding it down in the Front Bar with rock n’ roll, soul and garage hits. Get prepped for a very special night in the Danceteria, and be sure to come down – even if you can’t make it to Tin Pan Alley! Free entry if you’ve got a ticket to the show, otherwise it’s a tenner.